I thought I'd post a few photos that have come about through/since the photography course I've recently done. I've tended to rely on composition and good weather in the past, but working full time doesn't always allow the luxury of waiting for good weather to photograph the next magazine route. It's nice to know that I've at least tried to do something in manual instead of relying on 'auto' to read the conditions! I've been living in the Lakes for over a year and a half now, and have spent much of it exploring the Lakes, western Dales, the coast and more, but with so much on the doorstep I still hadn't ventured an awful lot further north despite easy access straight up the railway/M6 to Scotland. It would seem obvious to head straight to the 'proper' mountains, but there are so many wonderful hills much closer to home including the Moffat hills where a friend took me the other week for a little walk up Grey Mare's Tail. ​I've also been on a photography course at the Brewery Arts Centre in Kendal recently, so here's the first batch of shots I've posted on here which are taken entirely in manual mode, hooray! Just over a week ago the UK was treated to something pretty special... It's not often the sun is almost wiped out! With the moon covering 90% of the sun at the peak of the eclipse, it didn't go massively dark, but there was undoubtedly an eerie dimming of the atmosphere and a distinct temperature drop... Of course, I had chosen to view it from one of the most exposed spots in Yorkshire, the Coldstones Cut on the very top of Greenhow Hill... no escaping the chill wind up there! But what a show, and what better place to view from the top of a hill - Greenhow is atmospheric on the best of days. After turning up early to meet my friend, expecting the car park to be packed, I couldn't believe it wasn't busier... just a handful of people from the local area, all who knew each other in some way - a lovely community buzz! How the vast majority of the population hadn't booked the morning off work I have no idea! Despite the assumption clear skies would be required, the weather pulled a blinder... Just enough transparency in the cloud to let the light through yet just enough substance to let us see it without solar glasses... After a period using our sunglasses, by the height of the eclipse we didn't even need them - a perfect view. Not recommended under ANY other circumstance! We must have had one in a million weather conditions. What with working weekends and various other things happening, it’s been way too long since I went to the Lake District – the last time was August! At least it was memorable enough to keep me going a while! Anyway, the sensible decision was taken and we had a lovely wander up and down the railway walk from Threlkeld to Keswick – much more conducive to a good old natter and catch up between ladies who’d gathered together from all over the north, not to mention facilitating a lunchtime trip to the pub and gear shops, and that’s after necking 3 bottles of champagne and copious birthday cake. That’s three bottles of champagne between quite a lot of us, by the way! In everybody else’s defence, they did stay up till the early hours, it was just lightweight me who got straight into bed! With good reason though, I might add – with a minor reduction in wind speeds forecast for Sunday I was determined to get out even if only as far as Scales Tarn on the slopes of Blencathra… a stunning spot in August, but something else in winter! The winds were still strong – the full extent of which wasn’t apparent till we got much higher up the ridge – but reasonable enough at bunkhouse level to go up and have a look. This definitely was one of those days where knowing your own limits comes in very handy. I wouldn’t have gone up so far on my own because of the lingering danger and no guarantee of rescue if there was no phone signal… but I felt comfortable enough with two other people present, and Jane - another experienced hillwalker - and I knew that while we may not stay on our feet, we weren’t going to get blown off any cliffs and we were well equipped to deal with the weather and inevitable wind chill. On the other hand, by the time we reached Scales Tarn where the wind was funnelling quite powerfully and actually did stop us in our tracks a few times, we both knew we wouldn’t withstand the force of the wind on the summit and decided it wasn’t worth it even though our other companion was far more experienced and would have been happy to continue. It’s pretty reassuring if you are going to do these things to take one of the UK’s most experienced and renowned mountaineers with you: we were lucky enough to be in the company of Alan Hinkes, and if you haven’t read his unique account of climbing the highest mountains in the world, go here and buy it now: 8000m. 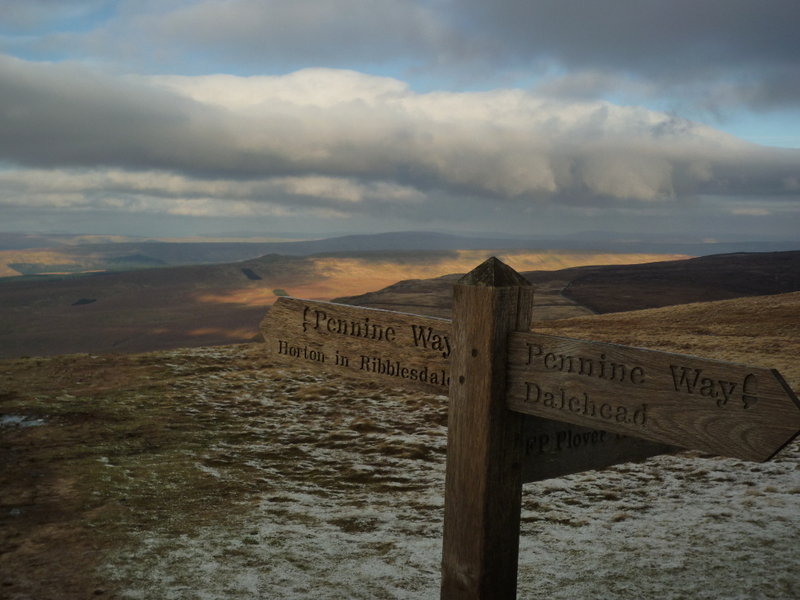 Britain's Most Brutal... the Pennine Way as you've never seen it! 268 miles, in January, through day & night, snow & hail, storm force winds and freezing temperatures with very little sleep... And all in under a week. If you're more of a 'fun run' person, how about the Spine Challenger at a mere 108 miles? ;) Congrats to Ed Catmur & Janson Heath in 1st & 2nd place. And if you think 79 hours is a long time to be running, there are plenty still out there as I write, still battling the elements after a whole week and more to come. What a job for the organising team too - managing a race in such extreme conditions and knowing at what point 'Britain's Most Brutal' goes beyond its own fearsome reputation. I use the term superhuman way too much in relation to ultrarunning, but these guys really are! Congratulations to ALL runners, support teams and organisers! I hope everybody has been able to get out and make the most of the beautiful winter weather we've had over the last couple of weekends! I managed to beat the Christmas Lurgy by telling it where to go and heading out into the hills anyway... even though I should probably have been tucked up in bed! But with scenes like these to greet you, who wouldn't?! I’ve been sharing quite a few artist and exhibition links on my Facebook page of late. I was interested in art throughout my school years and beyond and worked at Masham Gallery for some years in my earlier youth, coming into contact with many landscape and nature artists such as Ian Scott Massie and Hester Cox. It’s very difficult, to me, to imagine one without the other: landscapes and the outdoors so naturally (pardon the pun!) inspire through colours, shapes, textures and compositions; and many of the most important works and developments in artistic history are landscape related -Turner and Constable among so many others! Those of us who spend a lot of time in the outdoors also know that its appeal is hugely emotional, and when we're back home, sat indoors, we love to be reminded of that state of mind which sometimes only the outdoors can bring: a dramatic mountain vista, a serene riverside picnic or the majestic flight of a bird of prey. The natural world has also always inspired tales (and indeed beliefs) of the magical – which of course lend themselves perfectly to art’s freedom to explore imaginary worlds. I recently visited the ‘Prints and Pots III’ exhibition at the Number 6 Studio Gallery in Pateley Bridge, Nidderdale. Flora McLachlan’s miniature and sublime fairytale works transport us to an ethereal and undeniably magical world of dark woodlands, elusive white harts and mysterious tiny creatures hiding amongst the branches. Check out Ian Scott Massie’s Tales of the Dales too (as mentioned in a previous post). His latest exhibition and book full of Dales legends can be found in Art in the Bar, at the Angel at Hetton, part of a two-year series of exhibitions by local landscape and nature artists. You can sample the Angel's legendary food while you're there too! "With flaming eyes as big as saucers..."
I went up to the moors between Grassington & Pateley Bridge the other day to have a fairly short but jam-packed wander around the hills and the wonderfully eerie Troller's Gill. Mysteries, legends and ancient history are rife in this tiny corner of Yorkshire's moorland along with some classic geology and Victorian industrial wonders - and that's before you've even visited the famous Stump Cross Caverns! First of all, here's a bit of background on the caves, and they're well worth a visit: just as nearby Brimham Rocks' towering gritstone cliffs and pinnacles have attracted names for their mysteriously recognisable forms, so have the remarkably spiritual calcite formations scattered throughout Stump Cross's system been imaginatively presented as, for example, 'The Wedding Cake' or 'Sandcastles'. Let your imagination run wild - and don't forget tea and homemade cake in the visitor centre afterwards! Anyway, cave formations weren't the main focus of today's trip, but it was still Yorkshire's famous limestone playing the starring role. Troller's Gill is an entirely natural chasm in the ground - like its neighbouring caves, formed by water - yet its darkly towering gorge walls hint at something altogether more sinister looming just around the corner... and so there might be. Way back when the Norse Vikings made their way into the Dales over a thousand years ago, they left many a legacy in our place names and language, and Troller's Gill is one of them: quite literally, 'troll's bottom ravine'. "A ghostly dog - a bargest or padfoot - lives here with "eyes as big as saucers", eyes which flame, burn and will kill you if you look into them. There is a story that a man who lived near the Gill, and who had laughed at the stories, decided to spend the night at Troller's Gill. He walked into the ravine, on a dark night of howling gales, and made for an old yew tree in the heart of the Gill. He had come prepared with a charm to protect him. He summoned the beast by calling out and, out of the darkness the shaggy shape of the enormous dog appeared, its huge eyes glowing red in the night. His body, or what scattered pieces remained of it, was found the following morning..."
Incidentally, Arthur Conan Doyle's mother didn't live too far away from here... could our very own Troller's Gill Barguest possibly be a direct ancestor of the famous Hound of the Baskervilles?! The mysteries of this short but very well-formed route don't end with the Vikings and Victorians though... En route to the top of Troller's Gill from Stump Cross, you'll notice a few scattered and inconspicuous bracken-swallowed small gritstone boulders. Step back a few thousand years, and you'll find them being painstakingly carved upon by some of the post-glacial Dales' earliest human residents. Science and historical study have so far failed to confirm the precise reason or meaning behind such carvings, and perhaps it's a wonderful thing that they maybe never will... Just one small gem of mystery we can treasure a little bit longer in such a scientific age. This is Ange's blog covering both Feet in the Clouds and personal adventures in the hills and mountains! For more info click here.